This post was originally published on October 8, 2015 and republished on April 10, 2019 with updated content, photos and a video (located in the recipe card). Thanks for watching and sharing! Not all vegetables are created equally…take for example Brussels sprouts. No one seems to give them a chance, but I think they deserve their “15 minutes of fame”! 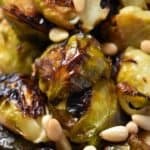 Hopefully you’ll agree once you taste this recipe for roasted Brussels sprouts with garlic- it might just become your favorite vegetable side dish to serve at all your holiday gatherings. Before you say anything, let me begin by saying, “I know. I’ve had those same thoughts.” Let’s face it – we’re talking about Brussels sprouts here, not chocolate cake. They always seem to make it to the top of the list for most disliked vegetables! Fact#1: Brussels sprouts are part of the Brassica family of vegetables, which includes cabbage, broccoli, kale and collard greens. Don’t they resemble tiny heads of cabbages? Fact#2: Nutritionally speaking, Brussels sprouts are powerhouses! They provide you with high levels of Vitamins C and K, dietary fiber, and a variety of flavonoids anti-oxidants – lutein and sulforaphane, to name but two – which, according to some research, can help protect from certain cancers. Fact#3: There are only 10 calories per sprout! That’s really low! Fact#4: Overcooking Brussels sprouts can sometimes produce that unpleasant sulfurous odor and flavor. We have to avoid this at all costs. The goal is to roast them in order to caramelize them. That’s when the taste transformation takes place. At this point, they have a nutty flavor. I could go on, but I think the best test is really to try them out. The markets are bursting with fresh produce right now. If you can, purchase Brussels sprouts on a stalk. This ensures a fresher product; look for tiny leaves which are a nice dark green. Avoid stem ends which look dry and are discolored; this is never a good sign when buying fresh produce! Brussels Sprouts. Fresh is always best for this recipe. Garlic. Feel free to vary amount based on preferences. Olive Oil. The fruity aftertaste pairs well with the nuttiness of the Brussels sprouts. Pine nuts. Or any other nuts. Parmesan Cheese. Optional but adds great flavor. You need about 1½ pounds for this recipe. Remove the Brussels sprouts by cutting them off the stalk. If you purchased Brussels sprouts without the stalk, trim the ends. Next, trim the outer leaves. These are always a little tough. You can freeze them and then just toss them in your next vegetable stir fry. Okay, so you’ve trimmed your sprouts. At this point, give them a rinse, and pat them dry with a clean tea towel. It’s time to roast them! Cut the larger ones in half. Place them in a bowl, add the olive oil (2 tablespoons), minced garlic (6 cloves) and rosemary (2 tablespoons fresh OR 2 teaspoons dry). 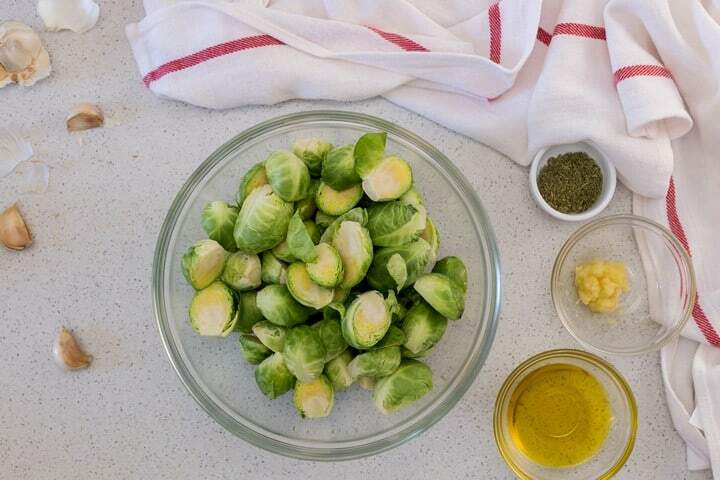 Toss together to ensure all Brussels sprouts have a thin coating of oil. Place on sheet pan and arrange cut side down. Place pan in the oven and roast for about 15 minutes. Turn them over and roast for another 15. Optional: Sprinkle pine nuts (¼ cup) during the last 5 minutes of roasting. 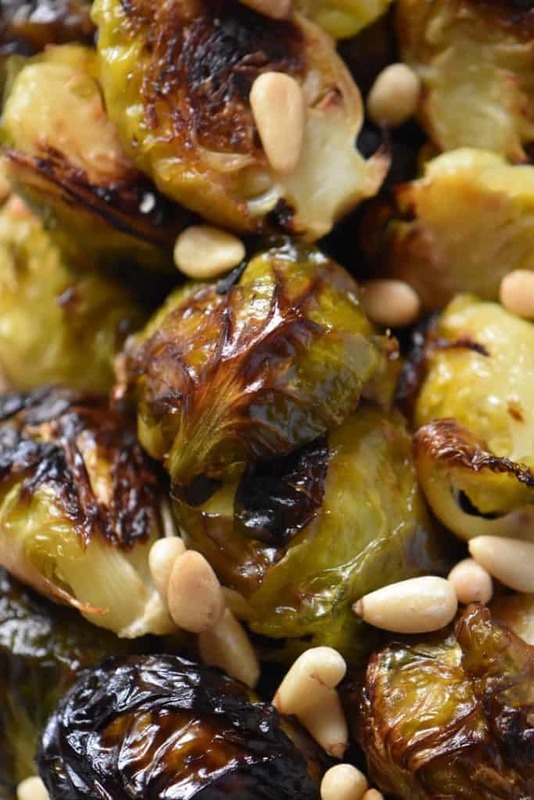 Notice the caramelized Brussels sprouts are a deep golden color which ensures a mild nutty flavor. Taste for doneness and adjust seasonings if necessary. 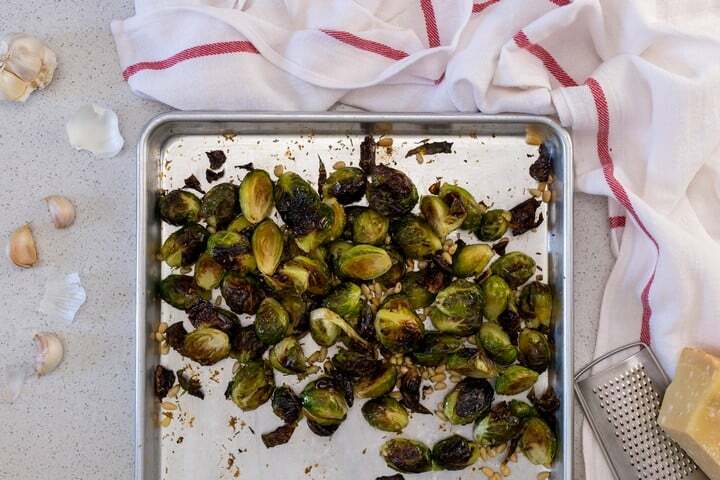 You want to roast your sprouts until they are crispy and caramelized on the outside and fork tender on the inside. Place on serving platter. 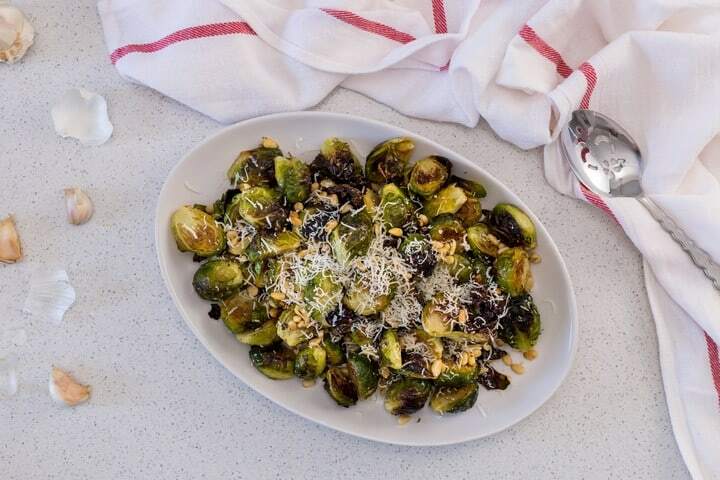 Grate Parmesan cheese (about ¼ cup) over the top of the baked Brussels sprouts. Dry properly. 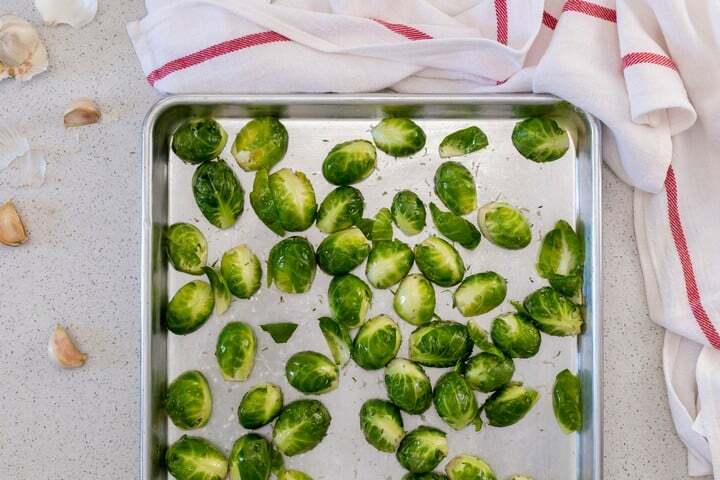 In order to obtain the crispiest Brussels sprouts, use clean tea towels to get that extra moisture out. Uniform size ensures even roasting. Leave the smaller ones intact; cut the medium one in half; cut the larger ones in quarters. Always preheat your oven. A hot oven is essential in achieving that crispy texture. Properly coat with oil. 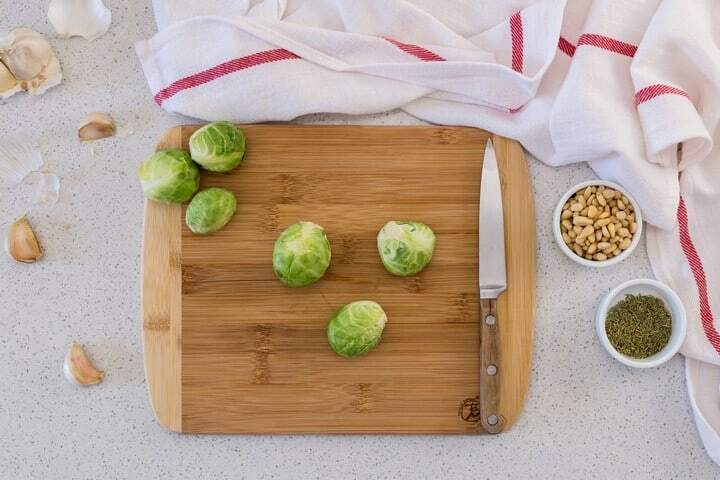 Use a bowl to combine all the ingredients together; ensure a thin layer of oil on all Brussels sprouts. Use different nuts. Replace pine nuts with almonds, walnuts, sesame seeds, or pecans. Endless possibilities. Use different toppings. If desired, replace grated Parmesan cheese with ricotta salata, feta or even blue cheese. Feel free to drizzle with balsamic vinegar or even lemon juice to get that flavor boost. Following the passing of my mom, my brother and his lovely wife have taken over organizing Thanksgiving dinner. They always put together a really appetizing meal for all of us! Almost a decade ago, my sister-in-law made a roasted garlic Brussels sprouts side dish, and I was shocked… I could not believe how good they tasted. I’m so grateful to her for showing me how wonderfully nutty these Brussels sprouts can taste once they are roasted. When it comes to cooking, you are only limited by your imagination. I was inspired by this recipe. I took the liberty of adding pine nuts, some grated cheese and eliminating the boiling step. Experiment and have fun with this! So, that’s my speil for Oven Roasted Garlic Brussels Sprouts! Have I converted any of you? 🙂 Would love to hear from you! 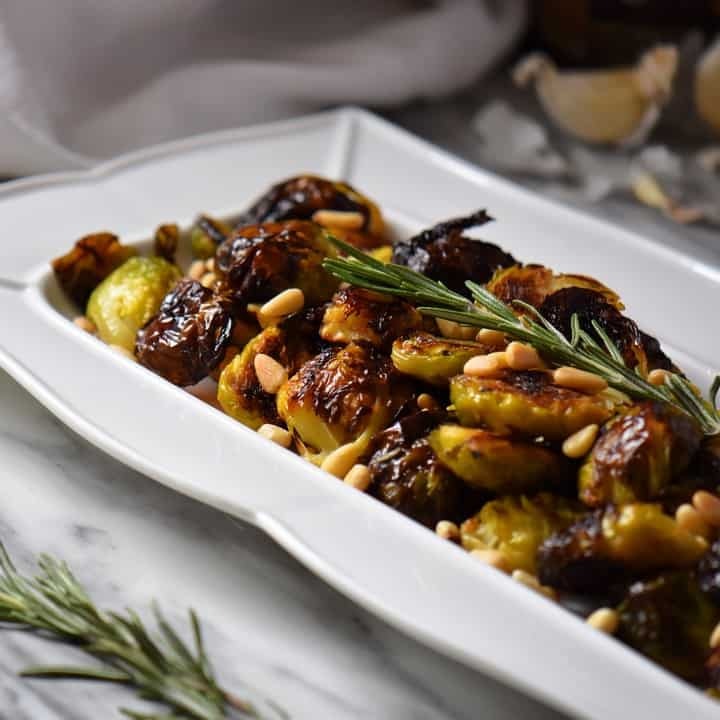 ★★★★★ If you have made this recipe for Garlic Brussel Sprouts, I would love to hear about it in the comments below and be sure to rate the recipe! Once these oven roasted garlic brussel sprouts become caramelized, they will take on a mild nutty flavor. Are you willing to try? Trim the ends and remove any discolored outer leafs. Cut sprouts in half and place in a large mixing bowl. Toss with garlic, oil, rosemary, salt and pepper. Arrange cut side down on a large sheet pan and roast for about 15 minutes. Turn over and cook for another 15 minutes. Add pine nuts during last 5 minutes of cooking time. Remove for oven, grate cheese over top and serve immediately. Can these be prepared and cooked the next day? I’m totally with you — I think brussel sprouts can be fantastic! I love your garlicy, oven roasted version. They look just perfect! Cheers. I just love brussels and I will eat them anytime and I like to also try to cook them in many different ways! Thank you for sharing this idea recipe! Yes! I so agree. My mom used to boil them to death, too. I hated them, until I learned that roasting results in a milder flavour with none of the smell! And garlic and rosemary just make everything taste better, don’t you think? I’m looking forward to trying this recipe. I, too, grew up thinking Brussels sprouts were gross. I tried them again a couple years ago and found that it really is all about how you prepare them. Thanks for the recipe! 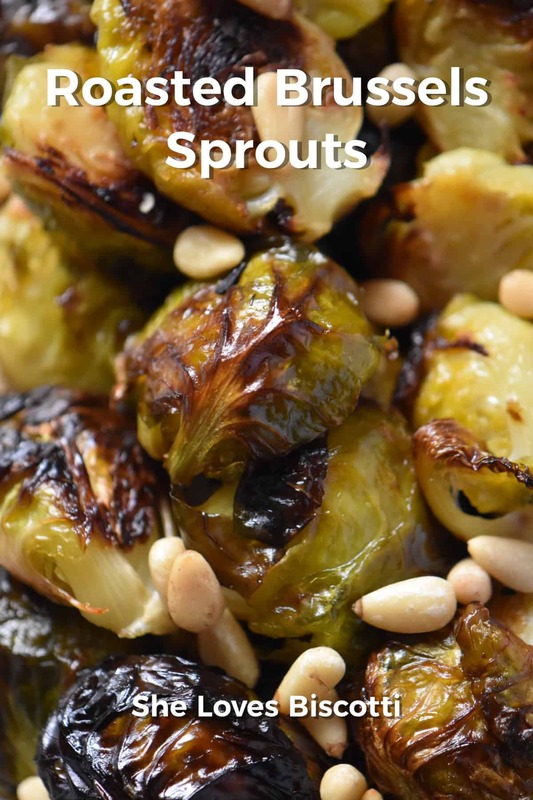 Very interesting recipe….i must admit i never know how to do brussel sprouts! Looks delicious….i will indeed try for my thanksgiving lunch! !